I felt like I missed out on something, not having read (or watched) John Green’s The Fault in Our Stars. Nevertheless, I wasn’t planning on reading it any time soon. I guess it kind of scares me because it’s supposed to be really sad (don’t get me wrong, I like to have a good cry over a book every now and then, but I think this one will get under my skin a bit too much). Then, I happened to come across the trailer of Paper Towns, which is an adaptation to John Green’s same name novel. The trailer starred Cara Delevingne (I love Cara!) and it seemed like a movie I would definitely enjoy to watch. So I immediately went to a bookshop and bought the paperback version, following my number one rule (which I will not ignore ever again): always read the novel before watching the movie, because you know you are going to regret it if you don’t. Also, I had just finished reading Tolstoy’s War and Peace, so I really needed something more ‘light’ to read. In short, Paper Towns describes how main character Quentin Jacobsen’s crush Margo Roth Spiegelman disappears after the two had a pretty adventurous night. Quentin starts looking for Margo using the clues she left for him all around town. I don’t want to spoiler anything, so this is all I will say about the plot. It took me exactly one day to read it. For the most, because I just needed to know the ending. It really felt a bit like peeing (see this posts quote). I just could not help myself, all I cared for in the 24 hours I spent (mostly) reading the novel, was what happened to Margo Roth Spiegelman. But, to be honest, I found the ending to be a bit disappointing. Although, that might have been the consequence of my own expactations while reading it. Nevertheless, the novel itself was a very easy read, with nice characters and an exciting storyline. 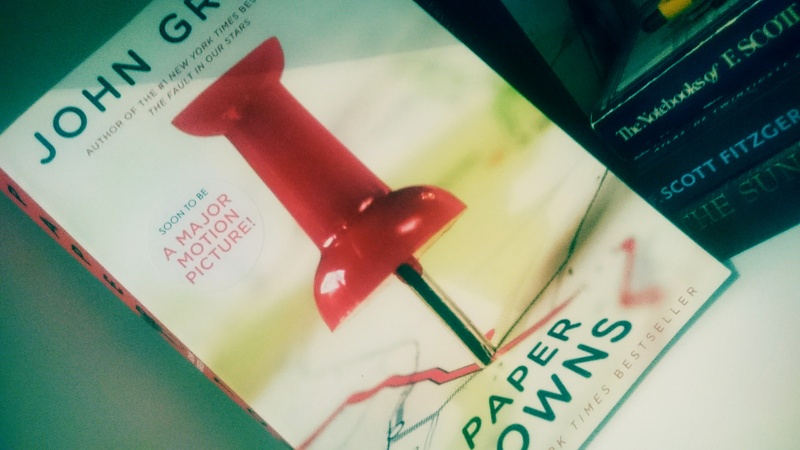 For me, Paper Towns embodies what I expect a YA-novel to be. Now I am only left wondering if I should read The Fault in Our Stars after all.